Stool Remida from Italian company Zanotts is en example of passionate and artistic Italian furniture design. 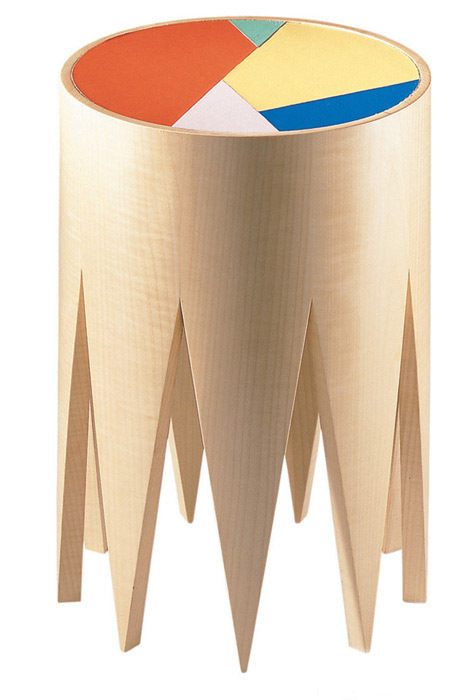 Stool Remida is a remake of anamt garde model, designed in 1922 by futurist artist Fortunato Depero. A friend of Umberto Boccioni, the artist studied sculpture, inventing and creating amazing furniture pieces. Avant-gard is a word used to refer to artists and designers or works that are experimental and innovative. Avant-garde style in interior decorating and furniture design represents a pushing of the boundaries of what is common and accespted as the norm. Challenging and inspiring, avant-gard stool Remida from Zanotta, http://www.zanotta.it/is made of bleached maple. The colorful seat is decorated with bright leather inserts in bright red, yellow, blue , white and turqoise colors. Avant-garde style is artistic and unusual that emerged in the early 20th century. Avant-garde style create new art forms and developing fresh furniture design and interior decorating ideas. The Avant-garde style in furniture design and interior decorating is about the color and shape, beautifully contrasting with each other. The contrasts and unusual combinations of materials are the main features of furniture design and interior decorating in avant-garde style.